This fall, we launched a new feature, the CSE Undergrad Spotlight, to shine a light on the diverse ways in which our students are contributing to our campus and our community. For our second installment, CSE talked to Melissa Galloway, a senior from Vancouver, Washington who is pursuing a double degree in Computer Science and Human Centered Design & Engineering. Galloway has been involved in undergraduate research, working with professor Zach Tatlock in CSE’s Programming Languages & Software Engineering (PLSE) group, and was selected as a 2016-2017 Washington Research Foundation Fellow. 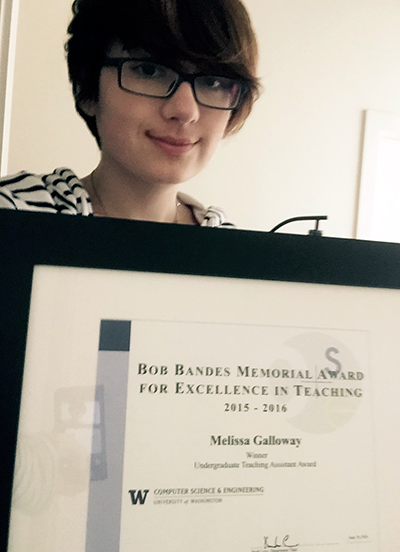 Galloway also dedicates her time to mentoring students as a Teaching Assistant for CSE’s popular introductory programming courses — a commitment which last spring earned her the Bob Bandes Memorial Award for Excellence in Teaching in recognition of her outstanding performance as a TA. This quarter, Galloway serves as the head TA for CSE 143 and as a TA for CSE’s Women in Computing Seminar. CSE caught up with Galloway just in time to mark the occasion of Grace Hopper’s birthday — a fitting tribute to someone who blazed a trail for women in computing, by one who is setting an example for a new generation. CSE: How did you discover your passion for CSE? MG: Similar to a surprising number of students in the department, I discovered computer science after arriving at UW. Entering college, I planned to pursue medical school, drawn to working in a fast-paced and challenging environment that presented new problems to solve every day. My particular interests were in diagnostics and genetic research. After taking my first CSE course, I realized that my interests in biology and medical school were much more strongly aligned with what an education in computer science could offer. As I have progressed through my CSE studies, I have found many connections to my earlier interests in biology, including the study of data structures and algorithms, compilers, parallel computing, and program optimization. I look forward to pursuing future research in computer science where I can combine CS with genomics and proteomics research, and potentially even integrate my interests in educational technology on a tool like FoldIt, which was developed here at UW. CSE: What is your favorite thing about being a CSE student? MG: It’s difficult to pick a “favorite,” but perhaps top of the list would be the variety of opportunities I have access to as a CSE student. Prior to joining the major, I participated in the CSE 14X program as a Teaching Assistant for CSE 143. Since becoming part of this community, I have discovered an unexpected passion for teaching and mentorship. I have found a number of opportunities to TA for different CSE courses and recently contribute more through head TA roles. This experience has introduced me to a community of similar-minded individuals who thrive on solving challenging problems and who also share a passion for introducing students to the field of computer science. I have additionally found research in the department a unique experience that helps reinforce my understanding of what I learn in classes through real-world applications. It also allows me to expand my knowledge base in new topics in the field. I have had the chance to work on research in different sub-fields, including programming languages and computer science education, and I have found research to be a very fulfilling way to learn while contributing to real-world applications. The experience has led me to my present goal of continuing my CS education through a Masters and/or Ph.D. program, and to ultimately find a combined role in teaching and research at a similarly research-focused university. CS: What made you decide to become a TA, and how has that helped you shape your long-term goals? MG: I decided to pursue this opportunity because my transition from pre-med to computer science was inspired by the instructors and TA’s I had in CSE 14X and 154, and I wanted to similarly inspire others to study computer science or related fields. As a TA, I have the opportunity to help students discover how exciting and fulfilling CS can be as a course of study — and help them to realize the potential CS has in real-world applications. I strive to provide students the tools and knowledge to succeed in their coursework as well as start their own programming projects on the side to reinforce their understanding of the material in a way that is most interesting to them. I also hope to serve as a role model for fellow TA’s and students who are thinking of pursuing teaching roles in CSE. Teaching gives me the opportunity to foster interest in the field among students regardless of their background or experience level. I find the “puzzle” of helping students understand material in different ways very rewarding. Since starting as a CSE 143 TA, I have continued TA-ing each quarter in different courses. This experience has influenced my current goal of pursuing computer science education. I have thoroughly enjoyed the many responsibilities I have had as a TA, including teaching a section, writing exam and section material, developing resources, providing individualized feedback on assignments, and inspiring other students to pursue CSE or related fields. Each quarter I teach I have found ways to contribute more to the course, and in my role as a head TA these past two quarters I have enjoyed learning more about the course curriculum and organization. Following my undergraduate education I plan to pursue a lecturer or professor role, which would enable me to have an even greater impact. CSE: You attended the Grace Hopper Conference for women in computing as part of a delegation from CSE. What was that experience like? MG: The Grace Hopper conference was an amazing opportunity — it showed me just how many women are involved in the tech field. While I had heard from past attendees that it would be an eye-opening experience to see so many female engineers at once, I was not prepared for the impact that it actually would have. At the conference, I discovered many opportunities for women to get more involved in diversity efforts as well as find roles at different tech companies. As a student pursuing research and academia, I found it very rewarding to see representation in these areas among the popular tech companies. I have realized that there are relatively few women pursuing teaching or research in CS, and meeting female leaders in these roles helped reinforce my goals of pursuing graduate school. Reflecting back on the experience, I believe that the Grace Hopper Conference will be one of the most valuable experiences I will have as a CSE student. I highly recommend other female CSE students to apply for the conference next year! Thanks to Melissa for being a great ambassador for CSE — and happy birthday, Grace Hopper!